He's a sinister figure with a detachable pumpkin head, but this isn't Jack Skellington (although he is coincidentally opposite Oogie Boogie in positioning). It's the infamous Headless Horseman, and during Halloween Time, he finds a home in Buena Vista Street at Disney California Adventure. Riding a nightmarish stallion on the planter behind the Storytellers statue, he takes a dramatic pose, glowing in green and orange in the nighttime air, holding his jack-o-lantern head high in the air to survey the field. It's almost as close as Disney gets to an outright scary scene, but it's also oh-so-photogenic! 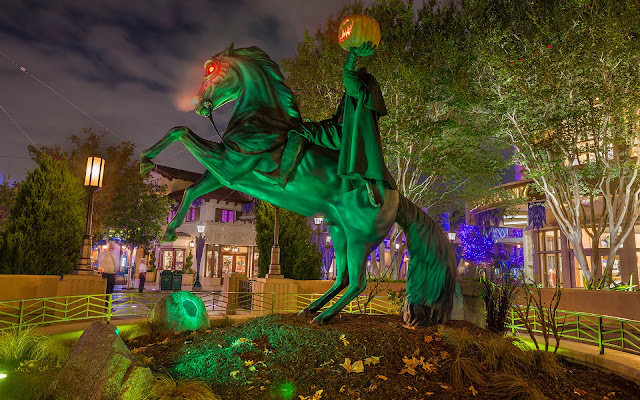 The Headless Horseman charges into the night at Buena Vista Street.